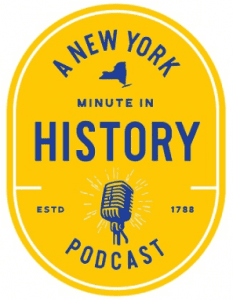 A new podcast, “A New York Minute In History,” is being launched which explores the story of New York State and the unique tales of New Yorkers. The podcast is hosted by New York State Historian Devin Lander and Don Wildman, host of “Mysteries at the Museum” on Travel Channel. It is produced by WAMC’s Associate News Director Jim Levulis. The first episode explores the lives of World War I soldiers Henry Johnson and Tommy Hitchcock Jr. through interviews with family members, historians and others. The podcast explores how both men were shaped by race and culture, and how each is remembered in different ways. Episode two, which explores New York’s leading role in the Women’s Rights Movement, will be available soon. You can subscribe to the podcast on iTunes, Google Play and SoundCloud. “A New York Minute In History” is a joint production of the New York State Museum, WAMC/Northeast Public Radio, and Archivist Media. Support for “A New York Minute In History” comes from The William G. Pomeroy Foundation. The project is also sponsored by a Humanities New York Action Grant with funds from the National Endowment for the Humanities. More information can be found on the podcast website or here.